Originally posted January 14, 2011, our fifth day as a website. Fringe was very new and very popular when I first posted this. Everyone was talking about this show. I really loved it as well. After the first season, I seemed to have quickly lost interest. 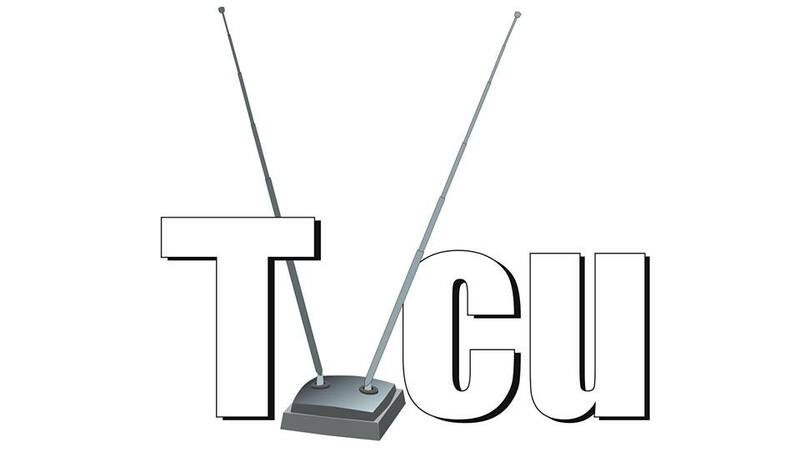 However, as far as crossovers and its presence in the TVCU, it's still a very important show. Tonight I'm going to talk about another fairly new show and the connections that keep it in the Television Crossover Universe. This one will follow along the same route as I did with Chuck. I will list things in a chronology with synopsis of each crossover. 1800s--The American Mock Trial Association--Here's an interesting crossover. In the "over there" of Fringe, Kansas and Oklahoma don't exist. In it's place is the state of Midland. Midland is the fictional state used in American academic journals and other settings for theoretical (fictional) legal cases, usually to raise legal issues that will challenge the students. The National Mock Trial association also uses Midland. I've played the father of a child who died after eating a toy in the state of Midland, and then a year later, I was a judge in Midland. 1987--JUL 28 - LIKE A SURGEON - Beauford "Ford" O'Donald, a classmate of Jack Kingsley from Belfry, New Jersey, turns up in Oldham Asylum in LeStrange KY, after a run-in with the Church of the Sleeping God. Jack and Peter Fitzhume Sr pose as psychiatrists to see him, with Ron tagging along, posing as their intern. Ford reveals to them that the Church was scouting areas around the country for a powerful ritual, under the guise of being roadies for Weird Al Yankovic and the Monkees (Peter Tork, Mickey Dolenz, and Davy Jones) on their concert tour (currently in Louisville). The cultists are exposed and flee. Jack claims to be Ford's personal doctor to have him transferred to the Dunwich Mental Institute, but instead O'Donald joins the Enigma Quorum to help track down the cult's chosen location, which he knows must be nearby. 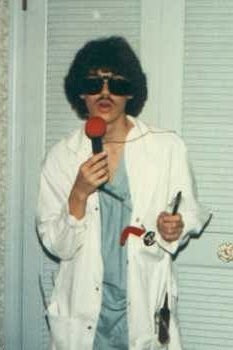 Ron Schabloski is so impressed by Yankovic (of whom he was already a fan) that he adopts a most unfortunate hairstyle for a time, and will later use the nickname "Crazy Ivan" in homage to "Weird Al". Davy Jones of the Monkees and Weird Al Yankovic have both met Mystery Inc. in animated form; on a 1972 episode of THE NEW SCOOBY DOO MOVIES called "The Haunted Houseman of Hagglethorn Hall" and a 2011 episode of BATMAN: THE BRAVE AND THE BOLD titled "Bat-Mite Presents: Batman's Strangest Cases" respectively (the latter crossover also involving Batman, Robin, the Joker, the Penguin, and Bat-Mite). Additionally, The Monkees have met the Penguin, Dracula, and other fictional figures on various episodes of their own show, THE MONKEES (1966-1968). 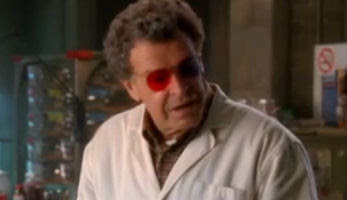 Dunwich Mental Institute is from a 2008 episode of FRINGE. Ford O'Donald, Belfry, Lestrange, Oldham Asylum, and the Church of the Sleeping God are [Kevin Heim’s] own inventions. 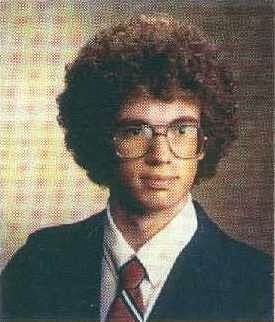 Regrettably, Ron's new hairstyle actually happened. Spring 1992--Bob Wronski visits New York city with friends John Barstow (once a member of the Heroes of Earth before Final Crisis and later the recording artist Johnny Bowtie) and Kenny Maxwell (formerly the supervillain Krusher before the Final Crisis). They visit the Empire State Building, legendary for the KING KONG incident as well as for being the headquarters of DOC SAVAGE. The Empire State Building is also the favorite building of architect Ted Mosby (HOW I MET YOUR MOTHER). The Empire State Building also connects to: LOVE AFFAIR/AN AFFAIR TO REMEMBER/SLEEPLESS IN SEATTLE, EMPIRE, PERCY JACKSON & THE OLYMPIANS: THE LIGHTING THIEF, FAIL-SAFE, THE PRODUCERS, THE TIME MACHINE, SKY CAPTAIN AND THE WORLD OF TOMORROW, WEST SIDE STORY, STEP UP 3D, THE OTHER GUYS, INDEPENDENCE DAY, KNOWING, THE DIVIDE, DOCTOR WHO, FRINGE, MYTHBUSTERS, AVENUE Q, THUNDERBIRDS, MUCH ADO ABOUT NUTTING, MOUSE IN MANHATTAN, and EVERYTHING IS EVERYTHING. There are also literary connections, but as regular readers of the Television Crossover Universe website know, I tend not to focus as much on printed material. Here is the list of films linked to the building from the building's own website: Since 1931, the Empire State Building has been an international icon and has been immortalized on the Silver Screen as a timeless classic for not only New York, but the world. As a hot destination for Hollywood, filmmakers have featured the building in more than 250 feature films to tell their tales. Some of the most memorable Empire State Building moments can be seen in "King Kong," "An Affair to Remember," "Sleepless in Seattle," "Elf," and "Percy Jackson and the Olympians: The Lightning Thief." August 2007--FRINGE # 1 (DC COMICS)--Prequel leading up the the events of the pilot episode. August 2007--FRINGE--"Pilot"--Ivan Ronald Schablotski: The pilot episode of Fringe mentions Dr Frankenstein in a throwaway line that could be just a slop crossover, but since Fringe is in the TVCU through crossovers with X-Files, The Prisoner, and the Bad Robot Universe (Slusho), perhaps this is a genuine connection after all. No first name is used in the discussion, Peter Bishop simply hears that his father Walter had been doing research into reanimation, among other fringe sciences, and asks if the speaker is saying that Walter is Doctor Frankenstein. October 2007--FRINGE--Olivia Dunham is flying in Oceanic Airlines. December 2007--FRINGE # 2 - 6 (DC COMICS)--After a delay, the rest of Fringe comic is released. 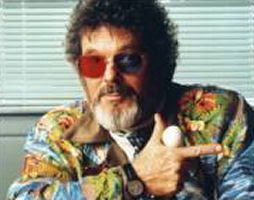 The series takes place intertwined with the series continuity. 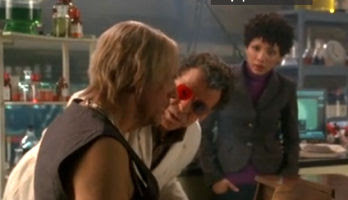 August 2008--FRINGE--"A New Day in the Old Town"--In this episode, a U.S. Senator makes mention of the FBI's X Division. The X Division's primary agents were for years Fox Mulder and Dana Scully of the X-FILES. (Thanks to fringebloggers.com for providing this detail. I had been researching for 30 minutes knowing there was some link to pull in Fringe, but unable to find any. I would have been upset if I had to scrap my work.) For more on this connection, click here. May 2009--TALES OF THE FRINGE--More comic book adventures intertwined with the series. June 2009 to Present--CHEW--From Matt Hickman: From the Tv Tropes page of Chew Shout Out: Tony's cousin in the Thanksgiving scene can be seen reading a Tek Jansen comic book. Savoy's nametag on his car mechanic disguise reads Hollis Mason. Olivia and Peter from Fringe show up in the background of issue 17 investigating some 'weird stuff'. An Observer shows up soon afterward. For the International Butter Sculpting Championship, two men who look suspiciously like Trey Parker and Matt Stone make a butter sculpture of Butters. Brown, the guy who can sculpt functional weapons out of chocolate, researches laser technology in a book that has a picture of a shark with a frickin' laser beam attached to its head. A Big Kahuna Burger appears in one of the pages. When Amelia's Psycho Ex-Boyfriend tries to sell Tony off to the highest bidder, one of the groups attending the auction is an Illinois chapter of Neo-Nazis. August 2010--BEYOND THE FRINGE--DC Comics series that is part of DC's "Beyond the 52". It is part of Fringe canon, and not part of DC canon. January 2011--PERSON OF INTEREST--"Risk"--There is an appearance of an Observer. March 2011--CHEW # 11--From Matt Hickman: Olivia and Peter from Fringe show up in the background of issue 17 investigating some 'weird stuff'. An Observer shows up soon afterward. Fringe references abound in issues drawn by Andy Price, due to the artist's love for the show. One of the freed ponies in Issue #1 is a Pony Observer - the grey hairless one, in a fedora and grey suit with a set of binoculars for a cutie mark - as confirmed by Price as part of his self-stated appreciation of the show. In spirit of the Once per Episode, "Where's Waldo? "-like appearance of the Observer in Fringe, an (the?) Observer pony has appeared in every story drawn by Price, including the two micro-series he did (Rarity and Luna), and the Sunset Shimmer short. All known sightings are logged here ◊. The Observer pony has even crossed over to stories with Amy Mebberson's art, appearing in one panel in Issue #15. One poster in the Rarity micro-comic is for "Velvet Sedan Chair", a band within the fiction of Fringe. The Sunset Shimmer short, given that it deals with her discovering about parallel worlds, has no fewer than five Fringe references on page 5: the books Shimmer read include "The First Ponies", "ZFT", "The Observers", "There is more than one of everything" and "Crossing Over by Bell & Bishop". It's probably some kind of record. 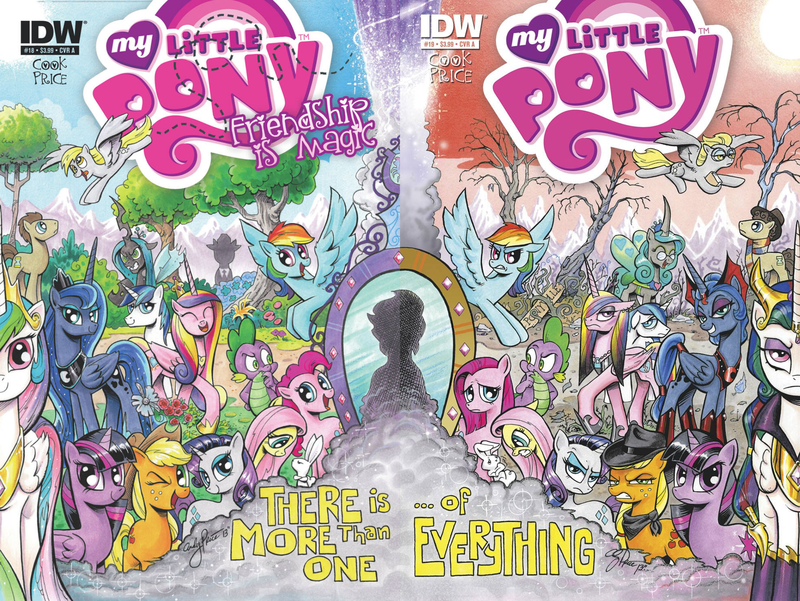 The first page of #17, the Observer actually speaks to Twilight and Spike, warning them "There is more than one of everything", and then disappears about as mysteriously as the Observed did on Fringe. 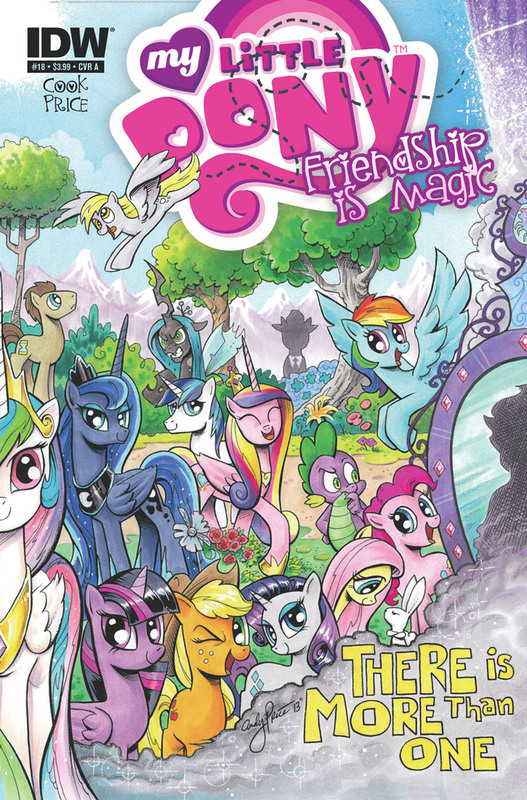 The Observer pony appears very much front and center on the Price variant for #18 ◊, part of an arc involving alternate universes. No way he's out of place here. In addition, his cover of Issue #19, which mirrors #18 ◊, give yet another title drop to the Fringe episode, "There's More Than One of Everything", and the two sides use the blue/red color scheme that Fringe associated with the two different universes. Issue #18's title is "Back To Where You've Never Been Before", another Fringe episode title. A flashback to Star Swirl's laboratory in #18 shows one book called "Cortexiphan Studies". "Over there" King Sombra's wall of study in #19 shows several differences between the two universes and other theories, many relating to Fringe, such as Manehattan being spelling with one "T", the lack of sugar or avacados in the "over there" and the lack of coffee in the main 'verse, the concept of amber, the double-F Fringe Division badge used "over there", and a "Resist" poster similar to the one used in Fringe's 5th season. Pinkie and Spike discuss how to name the evil versions of Celestia and Luna, a task that Fringe fans had done when the alternative versions of the main characters were revealed. One suggested by Pinkie, "Fauxlestia", follows with what became the canon name of the alternate Olivia, "Fauxlivia". Twilight's plans for how they will face the evil Celestia and Luna include a piece of paper with "ZFT" on it. The conclusion of the "Reflections" arc ends with the concept of the two universes merging and subsequently destroying each other to make way for a new one, which was an ultimate goal by William Bell's character (well, one of him) in Fringe. A splash page in issue #20, where the fate of both universes loom, show a numerous number of characters from both sides reacting to a dangerous explosion; the background for each set of characters is blue (the prime universe ones) or red (Good Sombra's universe), which mimics the blue/red used for Fringe. Further, in addition to the Observer pony, ponified versions of the main Olivia Dunham, Walter Bishop (with a white tulip cutie mark), and Peter Bishop, and the alternate universe versions of Olivia ("Fauxlivia") and Secretary Walter Bishop can be seen. January 2013--FRINGE--"An Enemy of Fate"--Fringe ended in a manner that allows it to stay completely in the TVCU. I'm very pleased. And it seemed to leave room for the proposed Fringe movie. October 2013--THE TOMORROW PEOPLE--"Pilot"--The two-Ms-in-a-cube logo of Mulkey Memorial Hospital in the Federal Reserve-theft paperwork resembles that of Massive Dynamic. 2014--MAR 16 - THE EMPIRE LUCKS OUT [ANTILOGY] - A space-time worm hole briefly connects Boston MA to a planet occupied by the Galactic Empire during a time before the Battle of Endor. The FBI's Boston-based Fringe Division calls in 50 New England based Ghostbusters (including Arkham Ghostbusters Ivan, Aaron, and Dani), who face Imperial and Alliance forces as they attempt to minimize cross-time contamination and close the gate. The disturbance is forced shut using Fringe technology, but its cause is never determined (Leprechaun involvement is suspected, though in fact the rift was technological, rather than magical, in nature). Division is from the tv seriesFRINGE (2008-2013). Ghostbusters are from the 1984 movie GHOSTBUSTERS. It should be noted that no coordinates within space-time are definitively attributed to the Star Wars characters' point of origin, as the subject of whether or not the Star Wars saga takes place within the same reality as the TVCU, as well as how long ago a "long time ago" actually is, remains in debate. Star Wars may take place in a pocket reality a couple hundred years in the past, or a much longer time ago, in a galaxy far, far away. 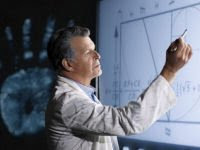 The Possible Future--FRINGE MOVIE--At San Diego Comic-Con 2012, actor John Noble mentioned that a film could be made further down the line. 2037--FRINGE--"Letters of Transit"--In the future that may come to pass, the Observers rule our planet, and run things very much like the Village, with an implication that they were behind the Villages of the past. This is only a possible future, and it may seem to contradict other possible futures, but I believe that many alternate futures can work together if we consider how fractured our nation and world are becoming. It's entirely possible that one kind of scenario is happening, for instance in the Pacific Southwest while the Northeastern U.S. has a very different future scenario. 2387--STAR TREK--Romulus is destroyed, and a villain blames Spock. He chases Spock into the past, but they are shifted to an alternate reality, which I call the TVCU2. This would be the home reality of remakes of original TVCU events. This is the home, for instance, of the remake of A NIGHTMARE ON ELM STREET. So there was no altering of time. They simply shifted to the past of another reality where they were meant to go. The villain appears first, in 2233, where he causes the death of Kirk's father. Note this film has the drink called Slusho, which has also appeared in ALIAS, HEROES, FRINGE, and CLOVERFIELD. Obviously the drink exists in both realities. Those three shows likely happened in both universes. CLOVERFIELD did not happen in the TVCU, but likely did happen in TVCU2. TVCU-40-"Over There": I was previously of the mind that "Over There" was the Mirror Universe, which may have also been Pete's World. However, as Ivan pointed out to me, as the show progressed, it was revealed that "Over There" was created as a divergent timeline due to time travel interference. Thus, it falls into my theory of divergent timelines, in which most alternate realities that are connected to the Television Crossover Multiverse are actually variants of the Television Crossover Universe, in which at some point a time traveler showed up and created a divergent timeline. While the same original timeline still existed, a parallel offshoot timeline gets created in which the events diverge due to the time travel interference. (Doc Brown explains this so much better.) Thus, since they are both paths of the same reality, as the show demonstrates, any major ramifications to one reality can strongly affect the other divergent timelines of the same universe. That's all there is for now. Go to http://www.fringebloggers.com/explore/the-fringe-timeline/ for a better more in-depth Fringe timeline. I should point out that in episode titled "6995 kHz" there is a reference to numbers that are used to give people amnesia. These numbers have a great significance on the show LOST. LOST is also in the TVCU, but I think the use of these numbers is purely coincidence and doesn't count as a crossover. Well, I will get back to my Fringe dvd marathon, and bid farewell until tomorrow. Good night. It's called "Over There" in the show and it's often capitalized in columns by Alan Sepinwall, among others. Yeah, while researching I found that out about it being called "over there" on the show, but forgot to edit what I wrote. I'm still in Season One of watching the show on Netflix, so I haven't gotten to "over there" yet. I scoured the net for a solid link to Lost but couldn't find one. I'm sure one of the Wold Newton guys mentioned it in our discussion group, but that's also where I heard about the Chuck-Groundhog's Day link, which I also couldn't find any supportive evidence for. I'm sure the link is out there, somewhere, and if I come across it intentionally or accidentally, I will post it when I come back to Fringe (or when I cover Lost).